Here you can create or post your tribe from the other forum. Here is an example. Other Info: The Si-beans are a tribe of people that have been living on this earth for millions of years, it is unknown how they have managed to stay alive, but they are mixed into todays society, easily distinguishable from the ordinary Hylian or Human. The Si-beans call the tatoo's upon their face 'Moko' each one is different, but some are the same as the other, each tells a story of their family. 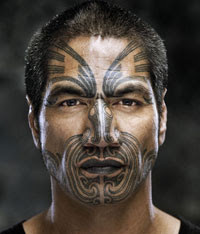 You will never find a moko that is the same. Appearance: Their skin is a darker shade than the average Hylian, they all have brown hair and brown eyes. Description: Head similar to the Bird of Paradise (think of this if you need a reference) with petals at the back of the head facing down. The mouth is hidden behind a small crease that goes across most of the head. They are eyeless, noseless, and only have frail appendiges to use. Their bodies are thin and slightly curled, so the head is not always the highest point of its body. They only grow to be about three feet at the highest, about the size of a small child. To compensate for their frail physical qualities, the Nobis are incredibly powerful magic users, using the petals on their head as conduits. Life Cycle: The Nobis live short lives, only about a decade long. Throughout their life the number of petals on their head varies, decreasing in number as the Nobis ages. In infancy and childhood, a Nobis will have a full five petals. By adolescence and young adulthood one of the petals has fallen off, leaving four. During adulthood another one falls off, then another once the Nobis reaches its sixth year of life; the "mid-life" for the flower nymphs. As they become elders, the fourth petal falls and the Nobis becomes eligable for the position of Dux--or leader--of the tribe. Once the final petal falls, the Nobis is dead. The petals on the Nobis' head are not only the source of their magic, but also the source of their life. Without the petals the Nobis die, and plucking them one by one is viewed as the most horrifying form of torture possible. Background: There was a time when the Nobis allowed themselves to be seen by others. An ancient biologist named the creatures "Nympha-florum", literally meaning "flower nymphs". The Nobis refused to allow other creatures to call them "Nobis", stating that only other Nobis could address them so familiarly. Instead, the biologist's term became the official name for outsiders to use. A large band of Nobis lived near a small village outside the Lost Woods. For years the two lived symbiotically as neighbors and friends. The Nobis showed their friendship each year by presenting them with a single Nobis petal: a source of magic so powerful it could enchant a dozen objects if ground up. One year a massive drought befell the land, reducing the village's harvest to little more than dust. The Nobis struggled to keep themselves alive as well, but they continued the tradition of presenting the petal nonetheless, knowing that both humans and Nobis would find a way to make it through the drought. Desperate for food and water, the humans were forced to sell the petal to a greedy enchanter, who demanded more petals once he realized their power. The enchanter promised riches to those who brought him the petals, and many villagers accepted the challenge to feed their starving families. One by one the friendly Nobis were abducted, stripped of their feathers, and thrown away. They never suspected such betrayal from their long-time friends and neighbors, and with heavy hearts they fled to the innermost part of the forest. Those who gave petals to the enchanter recieved nothing in return; the enchanter never intended to keep his part of the bargain, and used the magic stored in the petals to become one of the most powerful sorceres the world has ever seen. Now the villagers knew the sting of betrayal they had inflicted on the Nobis. From the day they sealed themselves inside the forest not a single person has seen a Nobis. They hide with their magic and sometimes turn foolish wanderers into monsters, still angry at the villagers' betrayal. The Four Castes: In general, there are four types--or castes--of Nobis: Pyro, Aqua, Terra, and Aero. As the names suggest each caste has its own specialty in elemental magic; Pyro in fire and light, Aqua in water and healing, Terra in earth and darkness, and Aero in wind and flight. When adressing a Nobis, it is proper to address the Nobis' caste first; a Nobis from the Terra class would be addressed as "Terra-Nobis", or "Terra-Nympha-florum" by an outsider. The Nobis do not have individual names, believing in total unity rather than idividuality. The only exception to this rule is the Dux, who is only addressed by that name. Over the centuries the castes have also developed stereotypes similar to their elements. The Aqua-Nobis for example, are very passive and just want everyone to get along, while the Terra-Nobis are generally stubborn and realistic. The Pryo-Nobis are impulsive and are always looking to for ways to boss the other castes around; this obviously puts them into much conflict with the Terra-Nobis. Finally, the Aero-Nobis are stereotypically absent minded and dreamers, going from one task to the next and then suddenly stopping, completely forgetting what they were trying to do. Religion: The Nobis believe and worship a God simply known as Nuum. According to the Nobis, Nuum is the perfect definition of unity; being completely indescribable otherwise. Everyone and everything is descended from Nuum, and will one day go back and be reunite with Nuum. To the Nobis, those who have become Evil on earth have simply lost their way, and have disconnected themselves from Nuum. Some of the radical followers believe it is the Nobis' responsibily to reunite "evil-doers" with Nuum...by freeing their immortal souls from their temporary body. Unique Language: The Nobis never open their mouths unless they are eating, and even then they eat in private. To open one's mouth is to invite shame upon oneself, as well as welcome misfortune. In order to communicate, the Nobis rustle the petals on the back of their heads, giving their language the nickname "petal chatter". As a Nobis grows older and its petals fall off, its "voice" grows softer. When an elder speaks, all other Nobis are to be silent and wait for the elder to stop speaking before resuming the conversation. There are almost no Nobis who understand Hylian, and those that do can only write it because opening one's mouth to speak is considered shameful. Similar Races: Supposedly the Deku Baba is the descendant of a sinister Nobis who abandoned his tribe to conquer the forest. In his hubris, he battled the Great Deku Tree for control of the forest and lost. The Great Deku Tree knew of the nymph's dark intensions, and bound him to the forest forever, never to walk again. Other Info; made up of four mountains, There is the north, south, east, and west Gurinfaita mountains and villages. Each village has their own variety of Gurinfaitas, they are all known for making good curry and swords. Are they a Race that have other Similar names? ; Gurinfaita are part of a branch if Faita tribes. Race: All races have members in it, with the exception of the Twili. Description: Very little is known about the Sempha Fidel. They keep out of sight to work in secret. Each of its members has a coin with the picture of a scale on each side; symbolizing the brotherhood's claim that Good and Evil are two sides of the same coin, and that both need to be kept in balance. What the members use these coins for is unknown. Background: No one knows when the Sempha Fidel was created; perhaps it has always existed in the shadows of history. But to those who know its existance the brotherhood's goal is clear: maintain the stability of society by keeping the balance of Good and Evil from tipping too far one way or the other. They fight for both sides--whichever one needs the aid--but never harm eachother in their struggle for peaceful balance. They deteste the Taigo family because of their determination to be completely free. To the Sempha Fidel, this is very contagious and dangerous thinking; total freedom only leads to destruction and chaos. Description: Silxx is a very unique race among Hyrule in its psychology. First of all, they often act as if they are an hive mind, preferring to use the term 'We' or 'We Silxx' (which is a rather incorrect form of their language as literally Silxx means 'we' in their native tongue, therefore 'we Silxx' means 'we we') to refer to themselves rather than 'I'. Secondly, they don't lean neither towards good or evil, they prefer to be on the side of the strongest, but, unlike Moblins, they prefer to support their side financially rather than phisically, giving them both weapons and money. Due to their unique biology Silxxes are very sensitive to magic, but to the point high magic presence weaken them, as if they were massively 'allergic to it'. They still seem to wish to spite the godesses by creating a tower so high (The Slisk Zkan: "High Hive") it will reach up the sky the Goddesses resides in. The reasons seems to be rooted down by the time the first Silxx were born. Because of thi, Silxx are ligthly xenophobic, thinking of them to be a superior race, but still consider most races as 'costumers', therefore are never rudes towards them. As said, Silxx usually live off as merchants and/or caretaker and teachers, and it's VERY rare anyone uses weapons, if any at all. THey are more likely to hire bodyguards. Money is one of the two main status symbol of the Silxx, as the ten richest families of Silxx are the leading classes and main government (Jrka Tji' Zken- Ten pointed Star). Rarely memebers of the Jrka Tji' Zken fall into disgrace, but if such, they are stripped of all their honoroficiencies. Now, what everyone was expecting. How do Silxx look like? To answer, Sixx have two forms. The first one is very humanoid, with small nose, big eyes, slightly larger than average feet and ALWAYS two long tufts which run down their body. Such tufts, which are actually their antennaes, is the second staus symbol: the longer the antennaes, the more noble a Silxx is. Two feet long antennas are ridicolously short, with the longest antenna even measured being 9 feet tall. Having their antennas cut off is a great humuliation to a Silxx. Their humanoid form is still verry upsettling, as they seem to be wearing rubber mask and skin, which is not a wrong guess, as it can be seen from their true form. In their true form, they show to be very insect like (usually every Silxx is based over a specific insect specie), with their jaws splitting verticallt all of them are in bright colors and have six insect like limbs, two making out their legs, and the other two the arms. They also have multiple striped eyes and the organs of their torso are exposed, having a ligher shade of the color of the rest of their body, which is otherwise as thick as a carapace should be. Interesting to note is the fact there are two subspecies of Silxx: Silxx Sextopodea and Silxx Arthropodea. The Sextopodea have six eyes, and their upper arm is split into two forearms, and they are unable to show emotions, while the Arthropodea have eight eyes, three forearms and display a wider array of emotions. Usually mating between different subspecies is very appreciated. Mating for Silxx is rather... unique, as it's done by essentially holding each other's wrist. The egg later are developed on the back of the female and hatch after three months. A baby silx looks like the hybrid of a worm and a toddler, and they are actually very ugly, with the flaps of the skins of their humanoid form hanging around and their pulsating veins visible through the skin. Because of this uniqueness, touching a Silxx is a terrible offense to them. Another unqiue quirk of them is their language, which is all composed of monosyllabes, therefore the first verse of a newborn is very likely to resemble a word of their language, with a specific meaning which, in the opinion of the Silxx, is going to determine the fate of the newborn and become its name. Sillxx are very good at making weapons, being more accurate than Gorons (although they focus on light weaponry, disdaining weapons like flails or hammers, preferring to create rapier, crossbows and the likes) , but they are much more expensive and less likely to threat you welcomely. A Silxx's lifespan is barely 5% superior to a human's. Races: Unknown; Types of shadow spawn and fallen Shiekah. Background: The Daedrunah are an assimilating race of Darklings, which are the members of the tribe. Their culture and history are tainted and filthied with senseless bloodshed and violence which the Royal Family tried to erase from history after the assumed collapse of the first generation Darklings. Their code of honor is unexistent. All forms of life are considered pathetic and expendable unless assimilated into their tribe. Once a part of the Shiekah tribe, the Daedrunah were shadow assassins that served the Royal Family. There was one Shiekah warrior, ruthless and cold with a cruel view on life. He resented and despised the Royal Family, and the Shiekah who supported them. He gathered the Shiekah who supported him, and split from the tribe after a violent raid on Hylians. Outraged, the Royal Family punished the Shiekah, who banished and shunned the shameless band of rogue assassins into the darkness beyond known Hyrule. The evil Shiekah man and his followers traveled far and deep into forsaken land, eventually setting up camp in a wicked valley. While he was alone one night, an Ebony Deity appeared before him and offered immortality and power if he swore his faith and allegiance to him. The foolish man accepted, and so began the birth of the Daedrunah. The band of rogues were corrupted into unspeakable shadow horrors, eventually splitting into many dark spawns: Darklings. The man himself became a fairy of death and gloom, serving as the champion of the Ebony Deity. Background: When the Twili were first sealed away, some of them managed to escape and go into hiding in Hyrule. They blended into society, resulting in a breed of very pale skinned people with strange black markings all over there body. When the current king deduced what they were, he ordered a mass genocide of them. The survivors fled underground, hoping to find salvation. They built a statue of the godesses and prayed for help. Eventually though, one particularly bitter Involtra grew enraged, and he prayed at the Shadow Temple for help. The dark spirits there transformed him into a huge monster, and he killed many Hylians. After this, the king decided to mount an attack against them to kill them once and for all. However, at that moment, the godesses interviened. They told the king to stand down, and the pale skinned people to go to the Shadow Temple. They did as they were told, and godesses informed them of there roots, and how they were naturally attuned to dark magic. They told them that, unlike there ancestors, they still had light in there hearts. They told them to serve them as there peace makers, using their dark magic for a noble cause. As there reward, they would one day earn the means to travel back to the Twilight Realm to meet there ancestors. On a final note, the godesses gave them a name: The Involtra. Today, the Involtra are all over Hyrule, protecting the innocent and the good hearted everywhere. They have been granted there wish, and each Involtra have the ability to travel to the Twilight Realm, so that they may reedem there ancestors through their actions. Religon: The Involtra follow a set of ideals, where they view life as something called the Ocean. If the waters of the Ocean are life, and the world we live in, the currents are the flow of time. The Involtra believe that the godesses gave them free will, and that each living thing must find there own way through "the currents" to redemption when they finally reach death. The Involtra, through these ideals, have a state of meditation called The Great Below, where they "swim to the bottom of the Ocean, and look up at the currents". Though going to the Great Below, a Involtra may assess there life and help deal with anything they may have done in the past, and decide where they want to go next. Going to the Great Below also allows some Involtra to communicate with the dead. That's very creative Robo. I especially like the religion. Background: The Legion of Power, or Ganondorf's Hammer, is the first ever known military force formed by the Dark Lord himself to consist of humans. Unlike his monsters, the Hammer is well equipt with fine weaponry and state-of-the-art armor/equipment. Their power rivals that of the Royal Hylian Guard, but they refuse to make themselves known unless Ganondorf usurps the throne. Many people who encounter the Hammer believe that they are traitorous Hylians and criminal scum, but there is a dark secret on how they grow in numbers. Legionary- A standard infantry unit with light armor, equipt with a sword and most of the time a shield as well. Some are weak, while some can hold out against "badasses". Judge- A high ranking Darknut with incredible combat skills. These are armed with greataxes or other extraordinary weapons. Judges are very rare. Religion: They worship their Dark Lord, Ganondorf. Oh! I like that a lot. I'll give it my seal of approval. Warmage- A soldier experienced in the art of destructive magic. They wear a type of armor and hooded mage robe hybrid for their attire. On their faces, they wear menacing face masks that resemble Ganondorf's face. These evil mages are armed with fireball spells and lightning spells. Some carry a shortsword as a sidearm. The villagers were endlessly tormented by demons and the strange taboo occurring on the mountain. Some were eventually driven to insanity and mass paranoia ensued. Half of the insane villagers set out into the thick pine forest to escape from the sane ones. Not long after, the insane villagers were became cannibalistic and began to attack the remaining sane ones. Years later, the Wendalfos spread all across Hyrule. Most moving to the Faron Province and making enemies with the native tribes. Appearance: No Wendalfos is truly alike. Their deformities are all unique, but the one thing all share in common is a large gaping cavity in the stomach/chest region. Their ribcages are exposed, and show a lack of digestive organs. Their hearts are black with many veins suspending it and they do not beat. Wendalfos were not entirely transformed, only grotesquely mutated into monstrous forms. Some may still have somewhat of a human appearance. Flesh is commonly exposed, with organs and bones rearranged for different purposes. Some may have the skulls of cows, goats, or horses for a head. Like I said, all Wendalfos are different. Red glowing eyes are a common trait, while others don't have eyes at all. Wendalfos communicate in grunts, or in some type of "velociraptor" vocalization. Others actually speak a language. Wendalfos make weapons from their enemies' bones, or salvage them. Others already have natural weapons to fight with. Religion: Wendalfos worship Legion as their god. They believe that he grants them with the power to slaughter their enemies. They honor him with sacrificial massacres and the killing of sacrifices over spikes. Interesting. I'm looking forward to how you use these guys. The Novafaitans are a naturally vicious and Martial race who have always considered battle to be the most effective way to solve a problem – negotiation and compromise are weak concepts to them. However, since Tage took leadership, the focus on war and violence has become a lot stronger and any peace that may have once existed or chances at forging potential allegiances are completely gone. Each Novafaitan is affiliated with one of seven elements and continue to age normally until they have complete control over their specific element. At this point they stop aging and the energy they draw from their element becomes their life-force and in order to continue living they must maintain it. If they stop using their power, their connection to their element grows weak and they eventually die. Overuse can also kill them. Essentially a balance must be kept. However, this does not mean they have the ability to become immortal. Like everything else, their life-force will eventually grow old and they will die of ‘old age’, basically. All Novafaitans are trained to become warriors from the young age of four where they are thrown into the deep end and training literally becomes a game of ‘survival of the fittest’. It is in their nature to have a very strong killer instinct and the idea of kill or be killed is drilled into their minds from birth; therefore, the weaker Novas are usually killed before they get the chance to reach complete mastery over their element. They exercise extreme loyalty towards each other, but are merciless and cruel to outside races and anyone who chooses to abandon the tribe or is marked with a brand in the design of a dragon; signifying their official banishment. The motto of the Novas is “In varietate concordia” which is Latin for “Unity in diversity” and represents that fact that they all specialise in different elements but when they come together, they are at their strongest. The elements are based off the sages and temples around Hyrule, with an extra one thrown in; Air. All Novafaitans worship the Triforce of Power as they believe in striving to the strongest and that strength without power is useless. They take prayer extremely seriously and believe that training is also a form of prayer as it should be carried out to honour the Triforce of Power and therefore gain personal power. Surrounding the village are seven small temples that each represent an element and house a shrine room where Novafaitans can go to connect with their element via meditation and prayer to Din. The village is strung with prayer flags that feature the Triforce with the Power third highlighted red on one side and on the other, the Novafaitan symbol. As mentioned above, seven small temples surround the perimeter of the village. 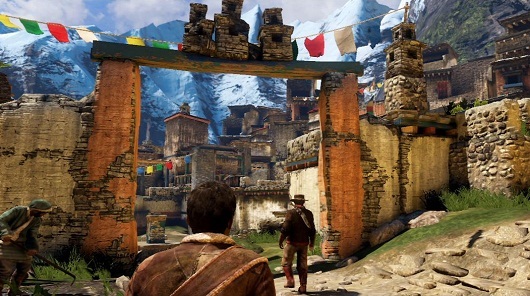 Training grounds are also found in the village and in the mountains. At the far end of the village, slightly elevated by the slope of valley, is an elaborate Tibetan style palace where Tage resides along with other important Novafaitan figures as well as his strongest warriors. Apperance: Involtra come in all different shapes and sizes, but they always have strange black symbols all over there bodies. They generally have pale skin. Otherwise, they are quite varied. Abilities: Involtra are all very naturally attuned to using dark/shadow magic. They are depicted as being faster, stronger and more resistant than most Hylians, partly due to massive exposure to magic, and mostly due to there genes. Thier dark magic manifests inself in many ways; it can be as basic as manipulating dark energy, to bending shadows, possession, seeing the dead, hexing and other methods. 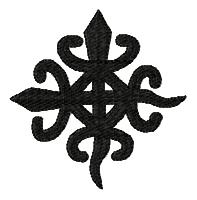 Some Involtra have a "charm" that inhanced and channels their dark magic, which can take the form of any object. Many Involtra use thier manipulation of darkness to enhance thier stealth abilites, allowing them to cloak themselves in shadows. Most Involtra also have a wide knowledge of how to deal with monsters; this is taught to them from when they are very young as apart of thier education. Today, the Involtra are all over Hyrule, protecting the innocent and the good hearted everywhere, serving as monster hunters and other exorcist type jobs. As they are essentially hybrid mutants, they are often looked down upon by holy people, refering to them as monsters, the work of the unnatural. However, many people accept the vilgilant peace keepers and monster hunters as a nessesicty, and often put up jobs specifically for them. Some villages hire an Involtra to live in the town as a expert on dealing with evil forces. Religon: The Involtra follow a set of ideals, where they view life as something called the Ocean. If the waters of the Ocean are life, and the world we live in, the currents are the flow of time. The Involtra believe that the godesses gave them free will, and that each living thing must find there own way through "the currents" to redemption when they finally reach death. The Involtra, through these ideals, have a state of meditation called The Great Below, where they "swim to the bottom of the Ocean, and look up at the currents". Though going to the Great Below, a Involtra may assess there life and help deal with anything they may have done in the past, and decide where they want to go next. Going to the Great Below also allows some Involtra to communicate with the dead. This isn't really a religon as such, as they don't worship a deity through it (most Involtra acknoledged the existance of the Golden Godesses). It is more a set of ideals through which they live by. Daloks a gorrila-like creatures with long claws. They have black fur on some parts of there body, but they mostly have black leathery skin. There heads barely have any features, having only two eyes, two tiny nostrils and a mouth that is only visible when its open. They are native to the Involtra Terminals, and are known to have originally dug them. They can turn invisble, and often use this when hunting. The thing is though, they are friendly to only the Involtra. Which is a bad thing, considering they are some of the most violent, aggresive, dangerous and powerful creatures living in Hyrule. When standing upward, they can be up to ten foot tall, and there claws can cleave through pretty much anything. And so, there are a few rules for engaging a Dalok once it has spotted you. 4) Don't play dead. The Dalok will eat you if you do this. 5) Don't show your back to a Dalok. It will attack/kill/eat you. 6) Stare the Dalok in the eye. It will roar in an attempt to make you go away, and then get bored. After this, it will leave you alone. 7) If the Dalok approaches you, slowly move away. Make any sudden movements, and it will attack. 8 ) Never, ever, ever, ever, ever, EVER attack the Dalok. Ever.